Shopping has never really been my cup of tea. For one reason or another, I do not enjoy shopping for long hours along Orchard Road, I have no desire for branded goods and I prefer to blog or craft in my free time. Yes, I'm the weird one among my friends and this made the hubby do a victory dance for his pockets when we got married. That said, being a mum and a housewife, there is one kind of shopping that you cannot escape from and that is grocery shopping. On days when diapers are running out, when the rice barrel is almost empty, when you have to squeeze toothpaste out from the tube, when you can't find a tissue after a sneeze, like it or not, it is time to go and do some shopping. I have to admit, I actually prefer shopping at supermarkets, IKEA and children departmental stores more than fashion boutiques. However, there are also days when I dream of being able to snap my fingers and voila, a bottle of detergent or a packet of baby wipes will appear magically before my eyes. Thanks to RedMart, I think that dream can now come true. Well, kind of. 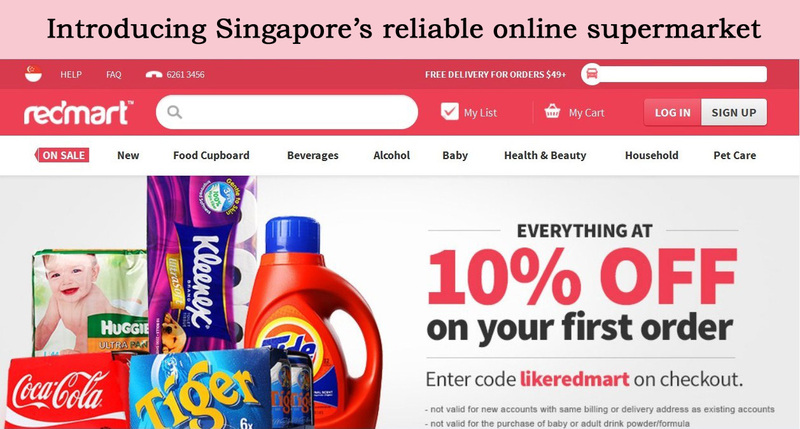 RedMart is a Singapore-based online grocery service that brings household products right to your doorstep. All you have to do is click! The great thing is that now when the baby is asleep in the bedroom, I can do grocery shopping while sipping a cup of hot Milo in the comfort of my living room. Now, who cares about messy hair and Hello Kitty pyjamas? Today, I will be sharing with you my user experience in using RedMart. Even though I may be an avid blogger, I am an amateur when it comes to online shopping. So trust me, when I say it is easy, it really is. Firstly, you will need to sign up before you can make purchases at RedMart. All you need is an email address and password. Once you are signed up, re-ordering becomes straightforward and hassle-free in future. Next, you can start to shop! 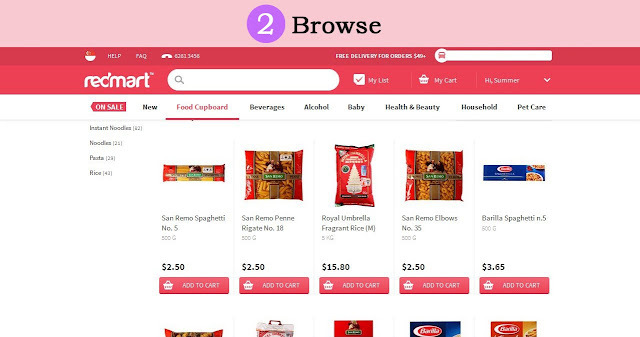 A total of over 4,000 grocery and household products are neatly categorised and you can click on the labels above or on the left hand side to browse through them easily. Those items which are currently sold out are also clearly marked. To find out more about an individual item, simply click on it to enlarge and you will be able to read the product details as well as view both front and back close-up shots which even allow you to zoom in. Once you see items that you would like to buy, click on "Add to Cart" and it gets added to "My Cart". You can adjust the quantity you desire as well as remove or add items before you checkout. The subtotal and delivery charges, if any, are also displayed on the right panel. 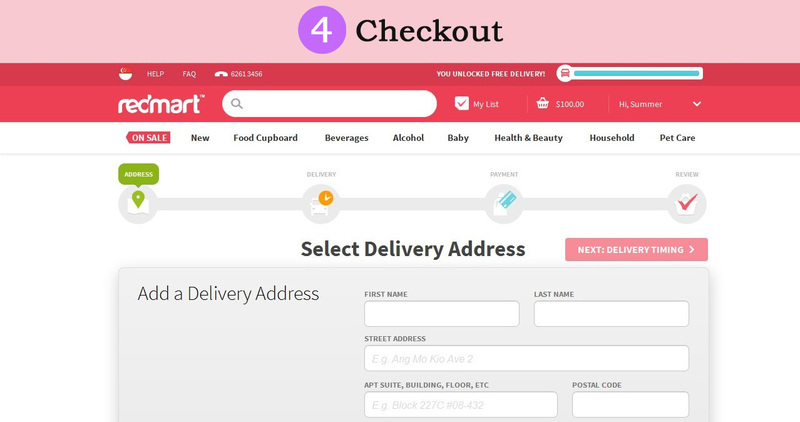 Lastly, all you need to do is to click on "Checkout" where you will be prompted to enter your delivery address, select a timing and mode of payment, and review your final order. If you are like me and do not like to stay for long hours at home just waiting for stuff to arrive, the good news is that RedMart provides two-hourly time slots on all seven days of the week for you to select. The earliest delivery timing is also indicated on the front page. For me, my orders arrive at my doorstep promptly the next day morning! Now that's efficiency and convenience. When you are pressed for time or looking for specific items, all you need to do is plug in your keyword and you will get a list of relevant matches, which helps to save time and effort in searching. My List is a collection of items you have previously bought and every time you make a purchase, the items are automatically added to your list and neatly sorted into categories. 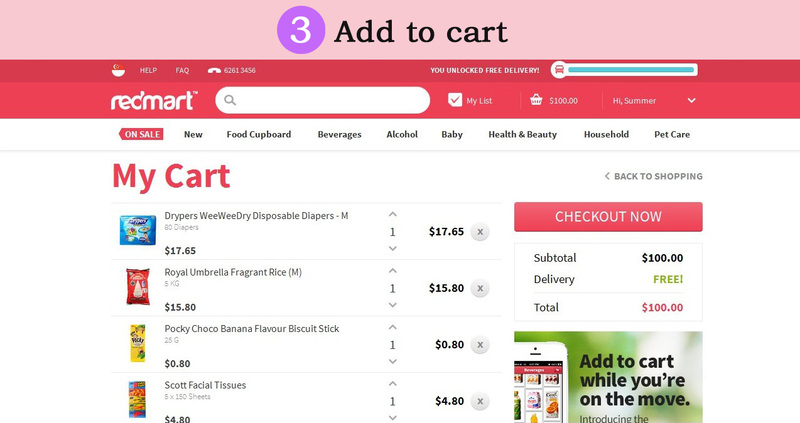 This makes it a quick and direct way to fill your cart with all your favourite products. There is also a function for you to sort products by popularity, price or brand in the sub-categories. This allows you to easily determine which product best suits your budget and needs without having to go through all of them. Woohoo! So these are what I bought from my first experience at RedMart. While I still need to run to the store to stock up on fresh food like bread and milk, online shopping has helped to meet all my other household needs. 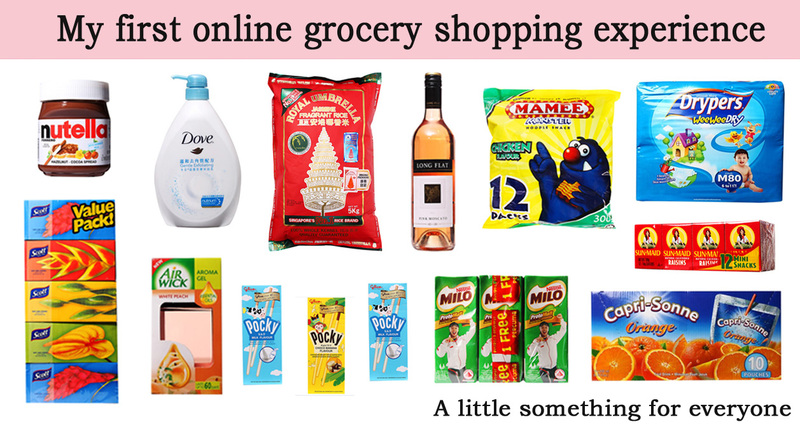 Now, after all the clicking, it's time to pop and celebrate this newfound way of easy peasy grocery shopping. A glass of Moscato, anyone? For all A Happy Mum readers, simply key in rm_hmum upon checkout to enjoy a 10% off your first purchase at RedMart. For iPhone users, you can now download the RedMart app to make grocery shopping even easier. Wow! Looks like a really convenient way to shop for groceries!! It is! Can't get all but at least most of what I need. :) thanks for reading, Irene! Thanks for sharing this informative post here. 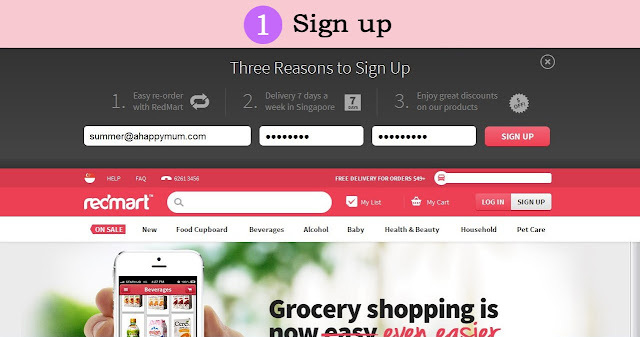 Redmart is awesome online path to shop groceries and household products. By using redmart voucher codes to can save more. Nice post and truly Redmart.com has fantastic array of products on their website. I also liked their website design and it is very easy to browse the website and make a purchase.